As I mentioned in my last post, I’m working on a new game project. The game is built around the idea of competitive tower building: two or more players construct freestanding structures out of basic components, attempting to meet a goal (for instance, achieving height) before the other player, while using special pieces (rocket launchers, lasers, etc) to stick a wrench in the works for the other guy. The vision I have is of a frantic, chaotic, and often silly competition as two players try their damnedest to kick the other’s tower out from beneath them while simultaneously trying to keep their increasingly wobbly and unstable structure standing upright. I’m currently in the prototyping stage, and trying to figure out what the details of the design should be. There have been a few thorny technical challenges (not the least of which was figuring out why the multiplayer wasn’t working) but the biggest outstanding issues are design ones. While the concept has a lot of promise, it’s been difficult to nail down exactly where the fun is. My first attempt has been lacking in that regard. That’s not a bad thing—this is why we build prototypes!—but it does mean I’ve got a lot of work ahead of me. 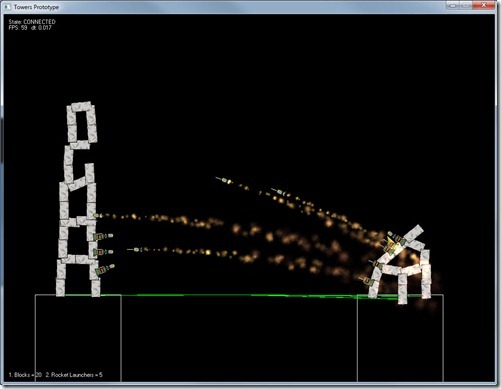 Players have individual “junkyards” from which they can draw new components to place on the field (at this point consisting of blocks and rocket launchers), which they can then place by rotating them, overlapping them with terrain or other components. 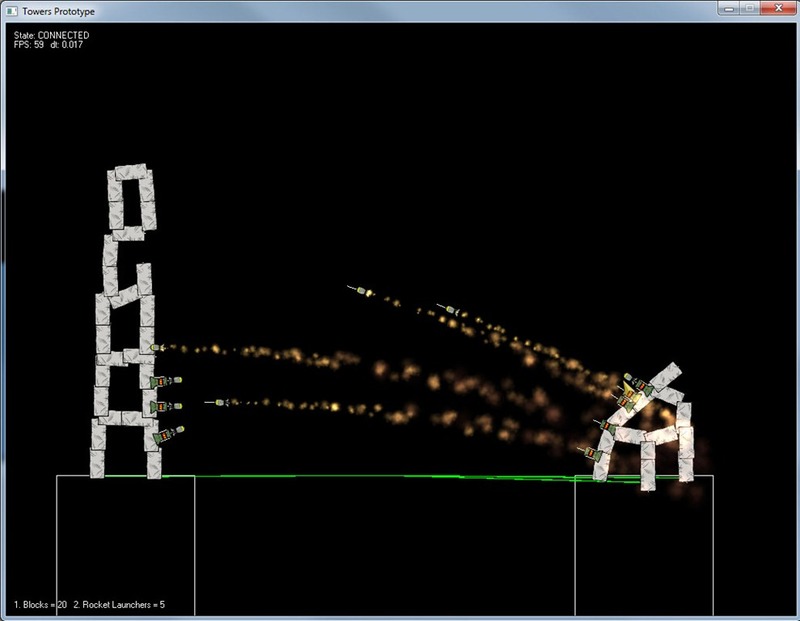 Rockets can be fired by right clicking on them, and they’ll slowly reload. Now, it’s not a bad start. The building method leads to some interesting structures, and Box2D (the physics library) means that when I knock towers down it’s entertaining… just like it was when you knocked down block forts when you were three! So, there’s some promise here. The building method isn’t fun. It’s tedious to build the tower up brick by brick only to have it knocked down (or spend an inordinate amount of time replacing bricks to keep it upright). Building towers is a core gameplay element: if it isn’t fun, the design’s a bust. There’s no meaningful objective. Yes, ostensibly it’s to build higher than your opponent, but there’s actually very little interesting about that. Again, a terminal failure for the design. If you aren’t presenting an interesting problem, you need to find one. Weapons, while entertaining, get old very quickly. Yes, it’s cool that the tower toppled, but that’s about all you can do with them. On top of that, manually firing the bastards gets annoying… more like whack-a-mole than anything else. Obviously, I’ll need to seriously rethink my design. I’ve started by looking at the competition. At first glance, this is difficult because I haven’t seen anything quite like it. However, two good candidates popped out after a bit of thought: World of Goo and Slam Bolt Scrappers. World of Goo (WoG) is built entirely around the idea of building wobbly, jell-o like towers to solve its puzzles, while Slam Bolt Scrappers (SBS) involves superheros stacking Tetris-style towers full of weaponry which they then blast each other with. My concept ultimately appears to be in the intersection between the two. Unfortunately, lacking a Playstation I am unable to give SBS a go: I can only rely on previews and media to get a sense of how it’s all put together. 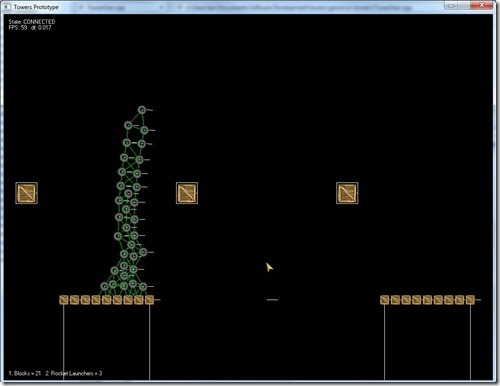 World of Goo, however, I immediately bought on Steam and played through, taking notes all the way. I’ll save my thoughts on WoG for another post. I’m now re-evaluating my design. My first focus is on how to make the tower building fun: it’s absolutely a requirement if this concept is going to have any value at all. I also want to streamline the combat mechanics, and provide clear objectives for the players to overcome. Closer to World of Goo now: placing a component near to another is all that’s required to weld them together. It’s a lot more forgiving, and gets rid of the need to rotate objects (mostly) but still isn’t quite where I’d like it. In particular, I’d like to get away from the “pickup, move, drop” flow of building towers. Even using keyboard shortcuts, it’s cumbersome and finicky. I’d like to be able to simplify the building process down to a single click: simply clicking NEAR the tower should be sufficient to place a new piece. finally new posts, sounds interesting. syncing all the physics online will be pretty hard tough. Not as much as you’d think! Since the simulation ends up pretty similar between the server and client, and user interaction with the simulation is actually pretty minimal, it ends up being pretty easy to synchronize… and even when it doesn’t sync up too well, it’s rarely a huge issue. That isn’t to say it isn’t something I’m going to need to work on, but it’s proven fairly lag tolerant so far. great to hear. can’t wait for some open network testing. When it ocmes to gameplay i think it would work great as a card game, you build and take cards, some card give you credits, more blocks or weapons, your opponent has a big tower, almost nearing the goal and surprise-you blow it all up. credits can go to new parts, weapons etc. balancing would be key here, cuz blowing up everything without any order would render building the tower pointless. « What’s this? A blog? When did I start writing a… oh, right. That blog.